... or Coop... I built a chicken coop! YOU GUYS!!! This major suburbanite has backyard chickens!! She wanted chickens, and when Mr. Goats gave us the go-ahead, she did a ton of research on what care chickies needed. She promised she'd clean, feed, and water them (and has actually done an outstanding job, so far). She even approached us about how she knows we'd probably have to cull when they stop laying, and said she's okay with it. Her excitement rubbed off onto me, and I would've never done this had she not been so actively involved. 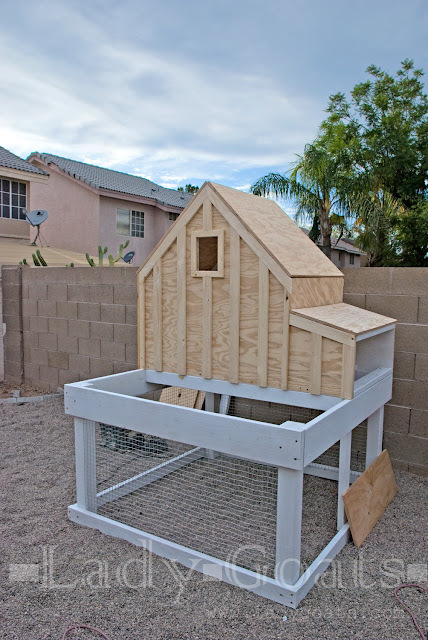 When it came time to bite the bullet and get the chicks (we got them from my good friend, Meg), we had to have a place to put them and knew that we were going to build the coop. But we were faced with some serious challenges. The coop HAD to be cute, because it would be visible from anywhere in our back yard. I wasn't about to put an eyesore in the corner of my yard. It had to be compact as I don't have a big backyard, but plan to get a lot of use from all of the space in my yard. It had to have an integrated run so that we could go away overnight and not have to worry about the ladies. It's worth repeating: It had to be cute. Drool-worthy, right? But the price (spoiler: it's $1500... before taxes)? NO, THANK YOU!! 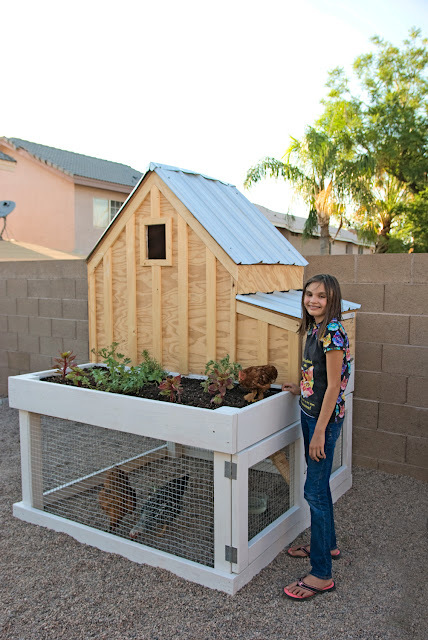 We saw that a lot of people built coops based on the design (check out Brooke's adorable coop! ), but I'm clueless when it comes to designing chicken coops. I needed help. So I asked Ana White to help out, and of course she drew up some FABULOUS plans! I originally wanted to build it from cedar, like the WS version, but it's nearly impossible to find cedar in the Greater Phoenix area, and it cost about 4x the cost of builder-grade lumber. So that was out. We settled on exterior-grade ply and builder-grade lumber. And then I got to work! 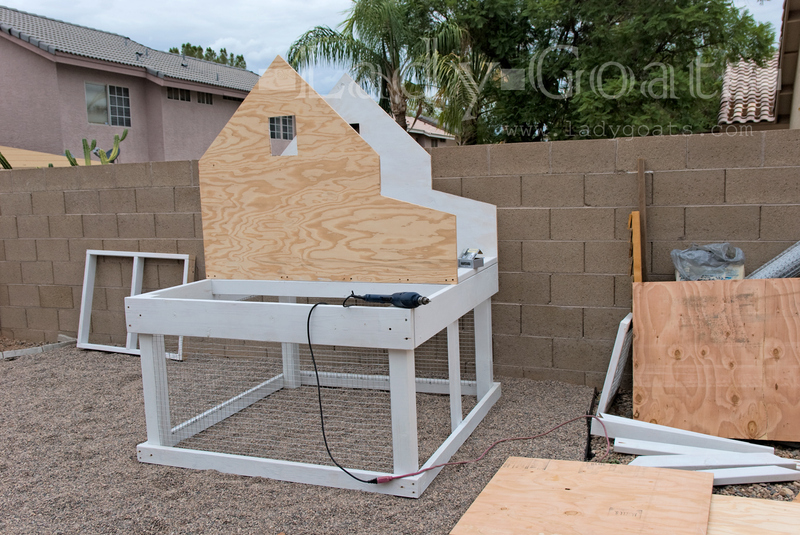 I went a little out of order on the plans, and cut out the coop from the plywood, first. 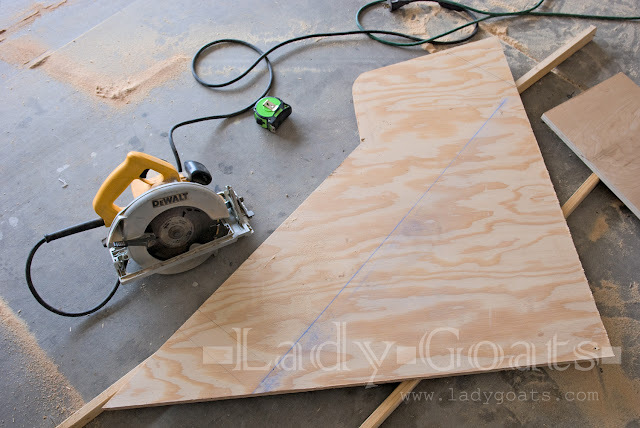 To make sure I didn't end up with wonky lines and inaccurate measurements, I marked the measurements on the good side of the plywood, and used a blue chalk line to connect the points. To make sure both sides matched up, I stacked both pieces of ply and screwed them together in all corners, and the top one was bowing a tad, so I put a screw where the window would eventually go. 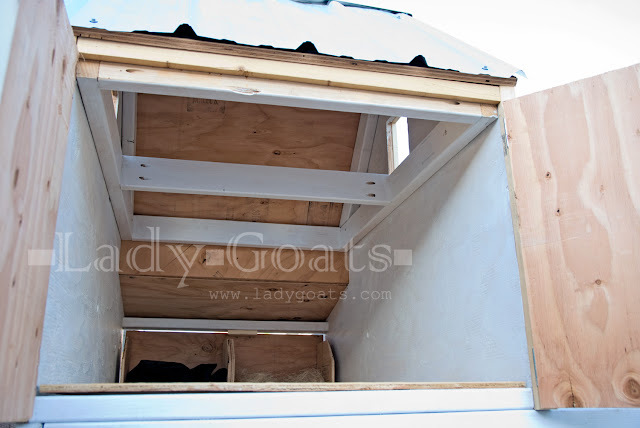 If your ply has a good and a not-so-good side, make sure that they're mirroring each other (bad side to bad side or good side to good side) so that the good side can face out on both sides of the chicken coop. 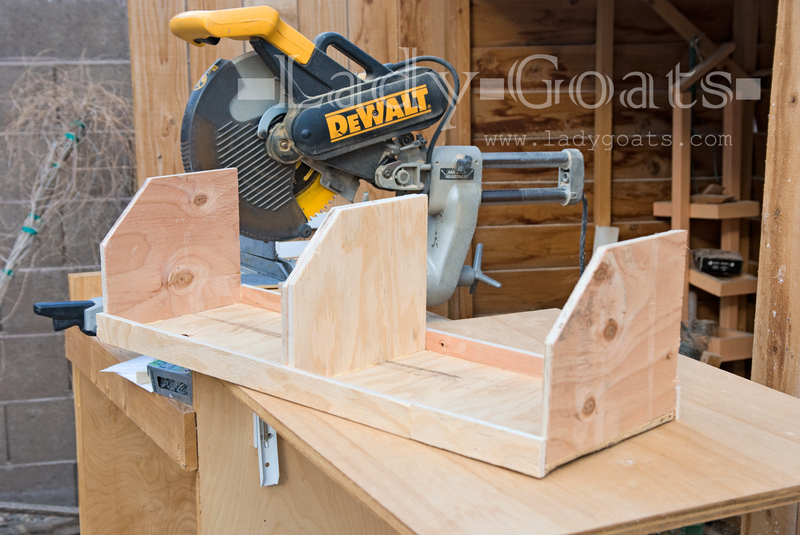 After the sides were cut out, I had to measure for the piece that would be the small wall above the nesting boxes, so here's where that came from (the scrap ply above the nesting box and roof - it's upside down in the photo). I measured that it could be 7 5/8" x 36, and ripped it to the 7 5/8" measurement. It was later cut to size on my miter saw. 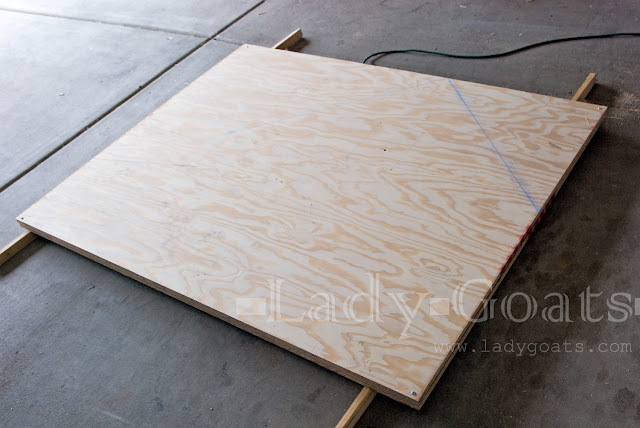 After all of the 3/4" ply pieces were cut, I went back to the beginning of the plan and built the base. Since I wasn't going with cedar, I chose to paint all of the pieces (all six sides of them!) to protect it from the elements. Painting this beast took the longest because of the humidity we're experiencing (yes, I chose to begin building this right when Monsoon season began - we definitely have a wet season in the desert!). I also chose to paint the inside of the coop before assembly so that I wasn't working in a confined space. The plans don't say to do this, but I pre-assembled the support boards with the roost so that I didn't have to hold a lot of pieces in place while trying to drill above my head. You can see that in the photo below, hiding in the back, left. What you probably didn't notice in that photo was the storm clouds, so I rushed to get this all assembled before the rain set in. Oh my gosh, if I had a clamp or another set of hands, this would've been one of the quickest big builds ever. By the end of the day, I had this. Don't let that blue patch in the sky fool ya. That night, we got rain. I chose to build a nesting box insert from some left over 1/2" ply. Link to building instructions here. Added the asphalt-felt stuff (technical term) to the roof, and lined/filled the planter box. I want to tell you what I did in the planter box, but it may change depending on available materials for you. I initially put some landscaping fabric on the planter, but felt that it would be a disaster if a hole tore in it and all the dirt fell into the run ("disaster" isn't too strong a word, right?). My neighbor had some leftover waterproofing membrane from a pond installation, so I poked about 3,526 holes in the bottom of that and lined the planter with it. Before I was offered that from my neighbor, I planned to use a shower curtain liner (with holes poked in for drainage) from IKEA or Dollar Tree. I just didn't feel secure using just landscaping fabric... That may be the perfect solution for you, however, so I suggest just using your best judgement. At the end of assembly day two we had another big storms so I got to plan out my roofing. The metal roof on the WS coop was to die for, so I chose that route. The roofing person at Lowe's (who was a retired roofer, not just someone who was assigned to that area) was really helpful in telling me what I would need to roof this coop properly, and helped me save almost $20 on unnecessary materials (moral of this is to ask someone who might know better than your google searches). And then it was time to cut (EEK!!) and attach the roof! I didn't get that finished until super late, so I didn't get any photos until the next day, after I brought the ladies home. Here's a shot of the inside - I plan to paint the inside wall over the nesting box, eventually, and will paint the inside of the doors... probably... You can see how they have a roost in the middle of the coop well above the nesting boxes (which I read is a necessity so that they don't sleep/poop in the nesting boxes). I occasionally think that I need another roosting bar maybe a tad lower/closer to the door, but the girls get up there and squish together, leaving room for like 3 more hens... so I'm not sure if it's necessary. Of course I'll let you know if I do eventually add one. What I DID add was some curtains. Yes. I whipped up a curtain system for my ladies. They need their privacy, okay? 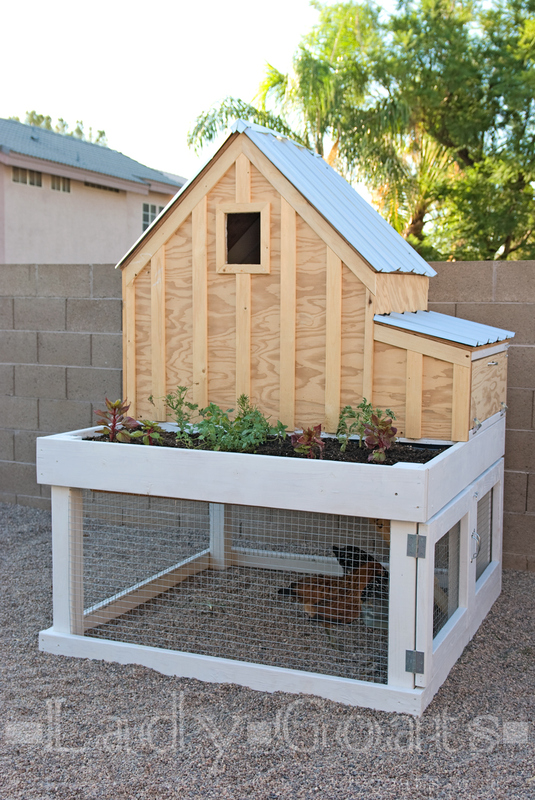 The PVC is 1/2" shorter than the width of the coop. 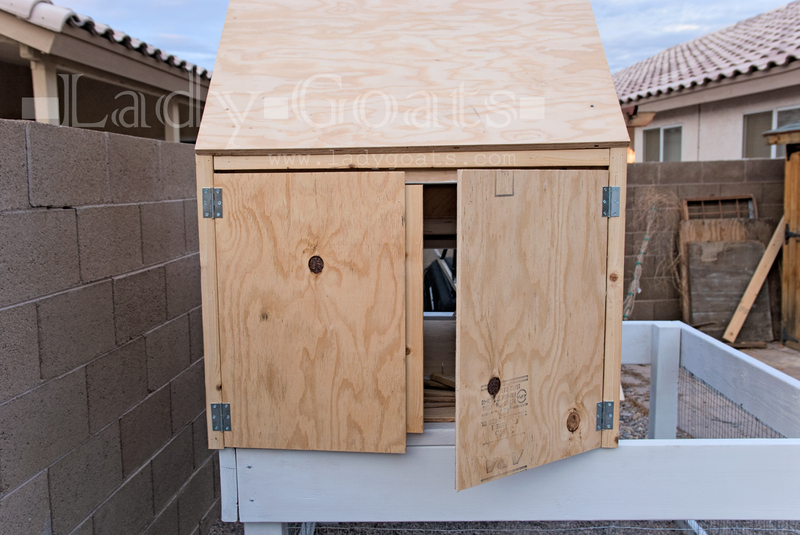 The 1x3s got screwed into the sides of the coop, and how it works is that the PVC is inserted into the side with the hole drilled in, and then it sets into the other side, resting in the notch. The blue paint is Valspar's Midnight Bayou, which was a struggle for me. Y'all know I love me some blue paint, but I wanted to stain this cedar-toned. The kid, however, had put in her fair share of work with the ladies, and I've been telling her that they're both of ours, so the right thing to do was to give her a say in the color of the coop. I adjusted the trim pieces (deviated from the pictures in the plan and the inspiration piece) so that I could paint the trim around it white. That was my I-want-to-choose-something-cute addition. And they don't use it. None of them have even once stepped foot on it, so far as I can tell, so it's been removed from the run. Finally I want to note that I completely changed how I approached the nesting box door. I really wanted to use the National Hardware full surface self-closing hinges (more for the fact that the door won't slam down than for the ability for them to close) so I chose to cut the door to be inset in the opening (and flush with the bottom). This meant that I didn't trim out around the door when I was cutting all of the trim pieces for coop. 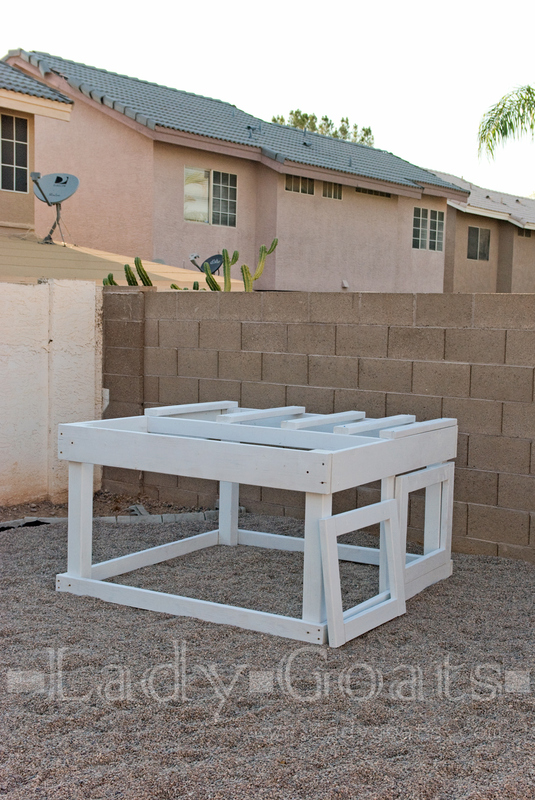 Make sure that you go show your love on the plans herehttp://www.ana-white.com/2016/07/free_plans/small-chicken-coop-planter-clean-out-tray-and-nesting-box. 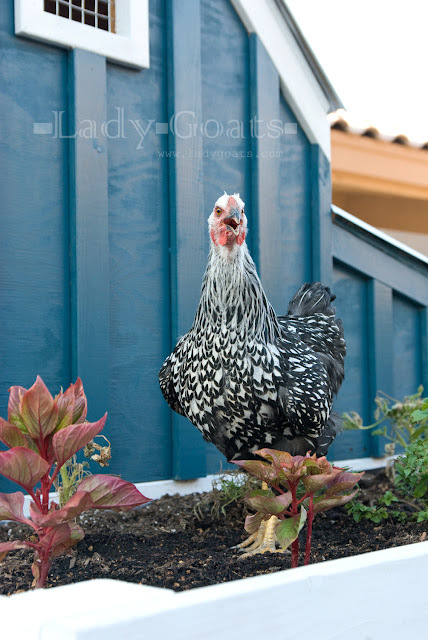 Do you have a backyard flock or plan on establishing one soon? How many hens did you get? Or can you fit? Or did you tell us and I missed it while I was wiping the drool??? Hi Andrea! Great question, and no, I didn't say! I got three hens; an Americana, a Wyandotte, and a Bantam. We let them free range, so there's plenty of room in the coop. However, rule of thumb is about 8-10sf/chicken, if you don't plan to let them roam. Adorable! I have some bantams that need a new coop and I LOVE this one. Can you give us a cost estimate? Thank you! Depending on your area, you're looking at $250-350. The best way to get an approximate estimate is to add the items from the "shopping list" to a cart on Lowe's.com or HomeDepot.com (make sure to set your store so it gives local information). Hope this helps! The instructions on Ana's website is incomplete. NO write-up on steps 17-28. Please help. I want to build this great coop. Hello, Fai! The plans on Ana's site are complete :) The form that she uses to input the plan has space for 28(+) steps, but this plan didn't use all of them. The final step is step 17 - inserting the clean-out tray into the chicken coop. Can you please provide measurements and instructions for the nesting boxes. I'm excited to build this. 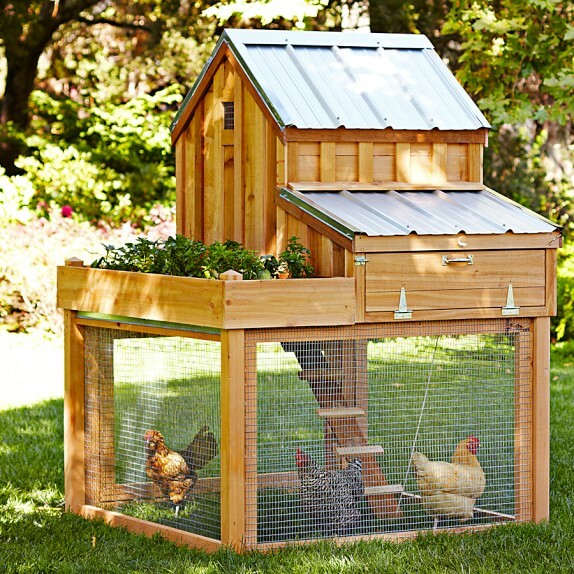 This may be a dumb question, but if they don't use the ramp, how do they get into the coop? 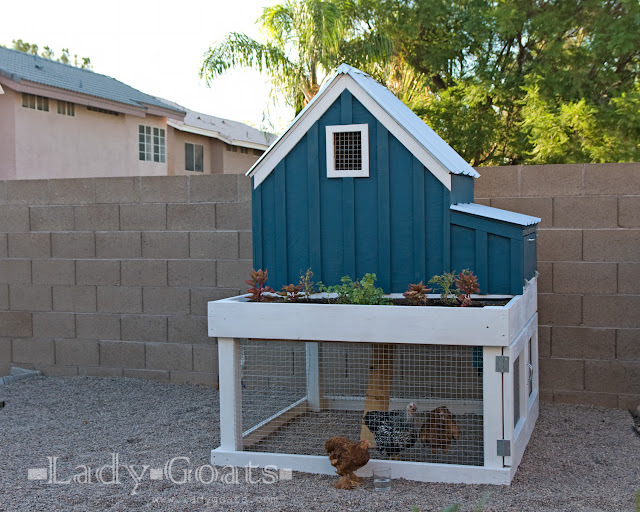 I definitely think this could be the coop we build for ours-- it's so adorable!! Not a dumb question! They fly into the coop. Just make sure you place the support beams on the bottom (even before building the house) where the hole in the pull-out tray is. The picture in the plans doesn't match. (I omitted the middle one) Then they'll have plenty of space to hop out/fly in. I have the base completed for this coop. I would love the measurements for the nesting box. Also, do you have any pointers on installing the metal roof? Did you just screw it directly onto the plywood? Did you use any flashing at the nesting box? Thanks. So exciting! I will get measurements for the nesting box tomorrow. The roof is plywood + 30# roofing felt + metal roof closure strips + metal roof (with galvenized sheet metal screws with gasket) + flashing. It got expensive, and I have way more leftover roofing material than I think I will ever use, so I would recommend talking to a roofer in your area (even just at your hardware store) to see what's recommended. I ended up not using flashing over the nesting box because I didn't like how it looked, but I did roll the felt up against the wall above the nesting box and it acts as flashing. I'm sorry, I forgot to get the measurements!! Just put a reminder in my phone to do it in the a.m.
9" x 31" x 10.25"
Made from leftover 1/2" plywood. 2 - 1/2" ply @ 3 x 31" (front and back lips to contain the nesting material). 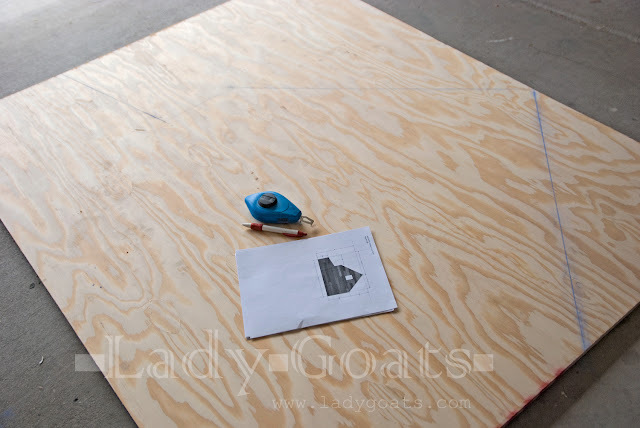 Step 1- measure where you want the dividers to go, and glue/nail the sides/divider(s) to the top of the bottom board. Step 2 - glue/nail the front and back lips, making sure to nail to the sides/dividers and bottom. Notes: You don't have to create the angled top as shown in my photos, it isn't necessary with this coop/nesting box design. I think the boxes are a little too big, so the material gets pushed around a lot. I think that since the girls only use one box, I'm going to move the divider over to give them an 11" box and use the other side for storage (the broom that I use to sweep the coop/scratch/snacks/extra nesting material, etc). It will be boxed off from the nest so they can't get into my junk! My fronts/back's are only 1.5" but they kick material out, so the 3" is my suggested height. It's up to you however high you want to make it. I was going to paint it, but am glad I didn't. They scratch the heck out all of it, and they don't soil it, so there's no point in painting it. I think that's it! Does that help? Let me know if I need to clarify anything! That's great! Been building all day. So tired but it's coming together nicely. These instructions are excellent. Just posted my pic to the Ana White plan's page. Those plans were fantastic. I am so proud of it! Thank you so much! Yes! Love this post. Thanks for sharing this!!! Also loved that coop and could not handle the price tag. I noticed you didn't continue painting the interior. Was this a weather related decision? If you were to pick to paint all of it or not paint the interior at all, what would you choose now? I have since finished painting the interior of the coop (except for the nesting box and underside of the roof). It was due to weather restraints that I didn't have it finished before this post (my friend had raised the chickens for me, and was waiting for me to pick them up! ), but slowly, as the girls have been foraging in the yard during the day, I've gotten it done (and definitely choose painting all of it - chickens are gross, so hosing it down is important, and easier to do when painted). My 4yr old gransond loves his chickens at our house. He loves looking to see hom many eggs we have. 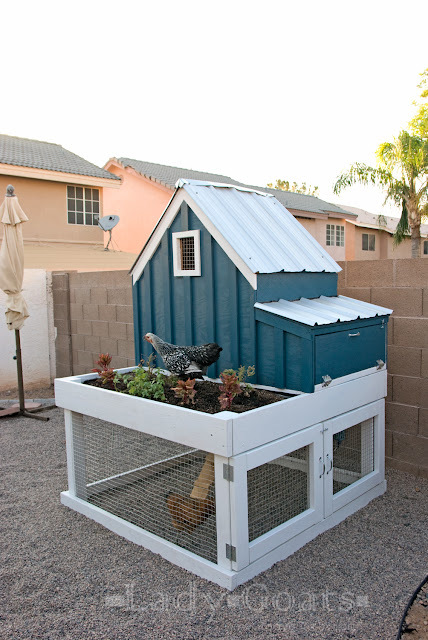 Really nice looking coop. we have 2 buff orpingtons, 2 rhode island reds and 3 barred rocks. Really fun pets. We're thinking about building this - how much did it cost you in materials, if you don't mind me asking? I have my eye on a coop someone is selling on craigslist for $250 but my husband seems to think he could build this one for cheaper.. I thought so too, but after all is said and done it was around $300. But, it is solid, will not fall apart and adorable. I'd make modifications if I had to do it again (for the sake of cold weather protection) so lmk if you proceed and I'll let u know bout those! Everything came out to over $300 on my end, but I realize that I have higher lumber prices than some. I recommend adding all of the materials to a cart on lowes.com, homedepot.com, or menards.com (whichever you'll shop). That'll give you a good estimate of how much you need! Jennifer - that was my concern, too, since I live in Oregon and we do get cold winters. I ordered fairly hardy chickens, but was concerned to notice the windows/vents right near the roost. I thought that might get a bit drafty in colder months. I was considering putting the vents lower, but then the draft would still come up..? Maybe lowering the roost? I would love for some ideas on modifications for cold weather protection! Hi I love your plans. Would two people be able to move it or could wheels be attached so it can be moved. Victoria, I do not think this is an ideal plan for what you're needing. It is top-heavy, and the house, itself, is screwed in only on the bottom (there's no real structural support for moving it on wheels). Now, I am imagining chicken tractors as what you might be envisioning, but if you put four wheels on this and push it from the base, that could work. But as a tractor, I do not think this is the plan for you. I have the same question as Victoria above: how heavy is it? I want my coop to be easily movable so I can give my hens a new patch of grass periodically. I was wondering if I should build the house to be able to be lifted off for easier moving. In response to Victoria and Sue, I want to say that this is not a chicken tractor plan. I don't think that it's a good idea to try to turn this into a tractor as-is, but with a few modifications, you may make it work. I think that taking the 4x4 supports from the base of the plan all the way up, and attaching the sides of the coop to them would be a smart way to add structural stability (enough to allow for it to be rolled at an angle), but that only helps with one side, and will change the inner dimensions of two of the 2x4 beams that go along the roof. That may or may not be enough. You may have to add more supports elsewhere. Would you make any changes for a colder climate? Yes. I think the original was built for a warm climate. I live in MA. I sealed all the joints with sealer and I built plexiglass windows that I popped into the screened windows. I also built an A framed 3 sided cover for the hole in the floor and I used warm fabric on the open side as a curtain that they push through at the top of the ramp. I also surrounded 3 sides of the bottom with clear vinyl that I bought at the fabric store to keep the wind and snow out. I did not end up using anything to warm it this winter and had no issues with frostbite. 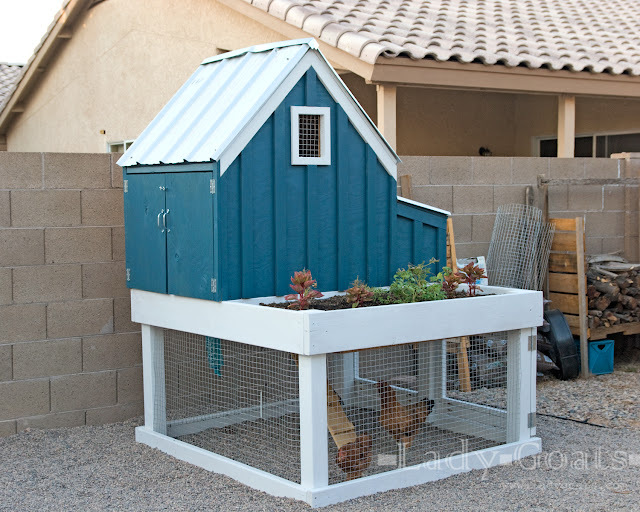 Would you mind posting a picture of your "3-sided A frame cover" for what I'm guessing is the access door for the chickens? I am in PA and will need a way to close or at least partially block the door in the evenings, especially in the winter. I will also need to protect them from predators since I live on a wooded property and hear fox nightly. I am very curious to see how this coop turns out. I'll be heading to get materials this weekend. Hi! These plans are great! We used them to build ours. I will be sure to share a pic. 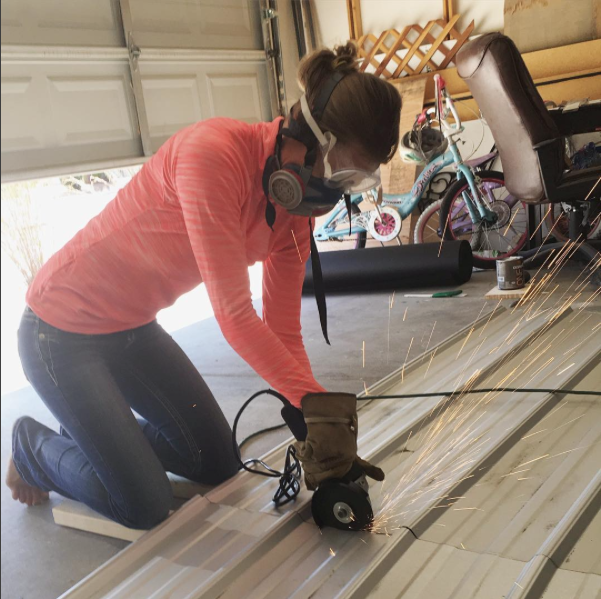 Can you share a pic of how you have the inside of the coop set up for your hens? Our girls are only about 6 weeks old, but I'm curious as to what the inside should/would look like for big girls! Thanks! 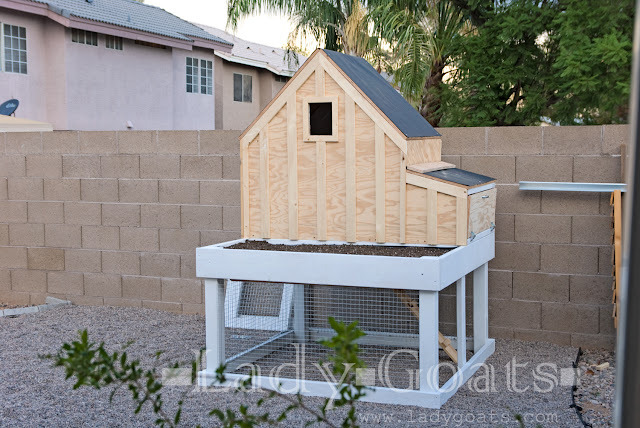 I will begin building this coop in the next week. I live in NC and wonder if I need the added protection in the winter time. Also, what steps do you suggest if the land is not level? Hi Steve, so exciting! The best place to show it off is on Ana White's website, she has a Brag Board that everyone loves to look at… Ana-White.com (or email me at ladygoats at gmail dot com, and I'd be happy to share!). A safe warmth solution I've used is a light socket kit screwed into a hole in the bottom of an upside down Terra cotta flower pot. Screw in a 40 watt bulb and set on a matching saucer. Gentle radiant heat that never touches bedding. I have a larger saucer and the girls perch around like campfire girls at night!! Do you shut the coop door at night? How do you do that? The way mine is setup, the door in the floor is always open. Then I attached a chain link fenced in run to one side of the coop. There is no need to close them in at night if you build the small run under the coop and secure that. They don't come out at night! Ok thank you! So with hardware mesh to enclose the run and buried as an apron fence around the perimeter for digging predators, they should be secure? Correct, make sure you use heavy duty mesh. I was able to find a heavy 1"x1" stainless steel mesh. I was going to try to bury it around the coop bottom, but my soil is so rocky it was pointless. I ended up just putting more rocks around the bottom of the coop. It looks decorative, should deter critters from digging, and was FREE! I love Steve’s coop! In my area (suburb of Phoenix) the only predators I have to worry about are aerial. I do not lock the coop whatsoever (I even leave the doors to the run open in the summer so the chooks can come and go as they please). I’m sorry, but I’m. It the one to ask about predator-proofing. Thank you for helping out, SteveNY! Thank you guys! You're amazing, and I love both of the coops! Hopefully soon I'll have my own brag post up on Ana's site to go along with both of your gorgeous coops! Hi Helen! There is a specific type of sheet metal screw was a waterproofing gasket made for metal roofs. I found them near the sheet metal screws at Lowe’s (plain sheet metal screws mat work, there are some made for screwing sheet metal to wood). The strip across the top was found in the roofing section, it’s a 90-degree angled section of metal to keep water outside of the roof. I recommend speaking with someone in the roofing department so they can recommend supplies needed for your climate and specific roofing supplies. Hope this helps! Hi there! This is perfect and I'm excited to try to build one myself. I do not have chickens...yet, but I want to build a winter habitat for the wild birds I've got everywhere. Wish us luck! I didn't really understand the inside. Is it just the nesting box off to the side and the rest is just blank space with a couple of roosts? Also, do you have food/ drink inside? Mounted? What is your form of ventilation? Yes, 3 nesting boxes and open space. I have a small waterer hanging from the inside and a heat lamp on a thermal switch. Outside is a large hanging feeder and waterer. Is there a li k to a material list and actual blueprints or measurements? Is there a link to a material list and blueprints with measurements etc? Great job by the way looks great! How many sq feet is this house? rule of thumb is 2-4 sq ft per hen and we want to start with 5 hens.